Separated good data from data which is suspect due to equipment malfunctions. Created charts which reflect the trends in data and how these trends show the effects of production demands, seasonal changes, and equipment downtime. Attempted various mathematical models which might serve to predict the fluctuations in data. Currently we hope to determine the constraints within the plant process and introduce a detailed mathematical analysis of the production process in order to optimize overall production efficiency. 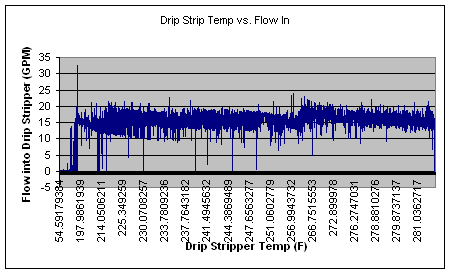 This illustration correlates the relationship between the Drip Stripper Temp and the Flow Into Drip Stripper. 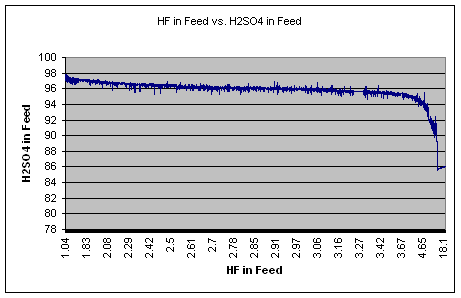 This illustration correlates the relatioinship between HF in the Feed vs. H2SO4 in the Feed.